In case you don't know Manchester, north west England, this is no ordinary city. It is said by some to be the first and greatest industrial city in the world. As the industrial revolution ignited, Manchester was a whirr of machinery, wide ranging skills, high population growth and unplanned urbanisation. I owe Manchester a lot, having studied politics, economics and law in this wonderful city. 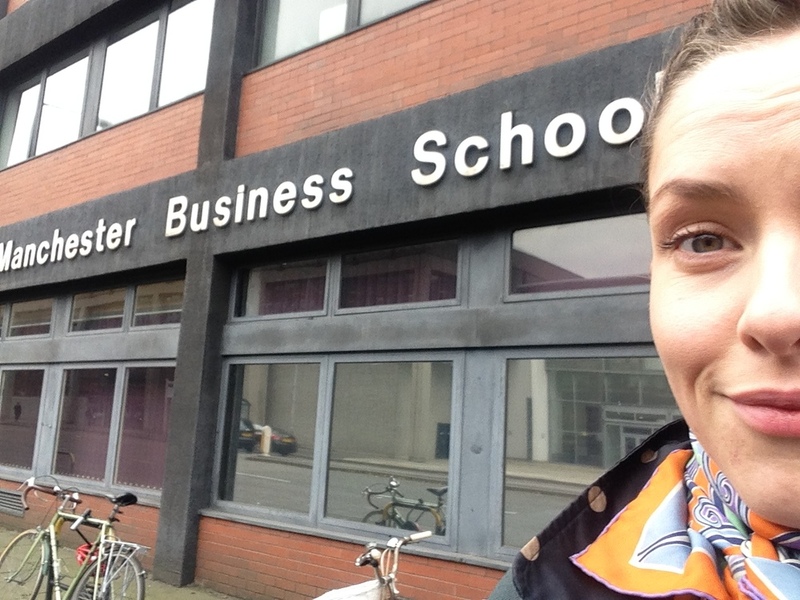 Yesterday I was invited back, to Manchester Business School, to speak as the founder of Riut (see my invention the RiutBag on Kickstarter now) to celebrate global entrepreneurship week 2014. Public speaking on behalf of Riut is a new thing for me: I usually stop unsuspecting people in the street or public transport (!) to see whether a RiutBag would improve their daily commute. This time, however, I was sharing my entrepreneurial journey with the next generation of innovators. The students at Manchester Business School came to learn from a normal person who had an idea, started up and took it to the crowd. I shared with them the last nine months which took me from my desk job, to leaving it, setting up Riut, surveying 1000 commuters, prototyping, preparing for Kickstarter and launching it. 1) If you have an idea, start. On the first day of your new venture, don't open a word document to write a business plan. Start making the core of your company: your product, your service, your idea. Whilst it's just an idea you will be blind to the real problems with it. Stop strategising and start doing. 2) Finish. There are some major milestones you need to reach. You can't just start things, you need to finish them and move on to the next thing. Start and finish the first prototype, move on to the next, start and finish your market research, start and finish your Kickstarter planning, start and finish your Kickstarter campaign. Start and finish everything required to make your new company to the best of your abilities. Learn, make mistakes, do it again, keep going, build on the things you've already completed. 3) Make meaning; don't just make a product. A bag is a bag is a bag. But we all use each object in context for reasons! So help your backers or customers to understand, with your product, how and why you're trying to help the world. What's the bigger picture? I've spotted that the rucksack hasn't kept up with our urban lives. So I'm trying to improve commuters' quality of life in cities. I'm also trying to show all people that a normal person or "user" can come up with an idea, make it and get it out there. I explain the meaning behind my business in my mantra: "Revolution in user thinking" - Riut. That's the name of the business: a promise to RiutBag users that I will focus on them now and in the future, and a priniciple to keep me on the right track every day. So that's what I shared with the students of Manchester Business School yesterday. Little did I know what an engaging, critical and constructive crowd I'd find there. From the staff to the students - computer science, design, business students and scientists - we had a great time. They grilled me thoroughly on my approach, marketing, intellectual property protection and future! I'm going back to Manchester whenever I can to be challenged by the multidisciplinary crowd of students and staff there. It's the perfect place for me to consider the positives and problems which come with urbanisation - crime, homelessness, high density living, yet exciting cultural exchange, economic highs and great innovation. The saying goes: what Manchester says today, the world says tomorrow. I'm proud to speak and do what I'm doing today and help Manchester's future innovators take their ideas to the world tomorrow. My Kickstarter campaign - the revolutionary RiutBag bag - is live now. Only until 26 November 2014.